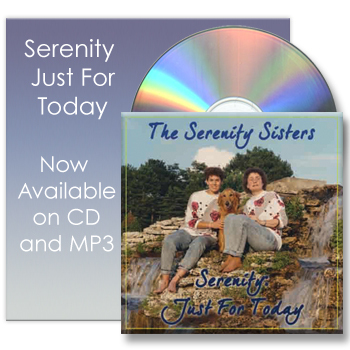 The Serenity Sisters' CD The Serenity Sisters - Kathy and Sue - met in 1987 in St. Louis, Missouri. Their big debut occurred in the spring of 1988 when they sang before a group of 500 recovering women at an AA luncheon and received a standing ovation. They sang together for nine years. During that time they shared their music at retreats, 12-Step functions, churches, schools and coffee houses. Kathy and Sue have since relocated: Sue to Jefferson City, Missouri and Kathy to Bonita Springs, Florida. The Serenity Sisters recorded three albums, which are now available. 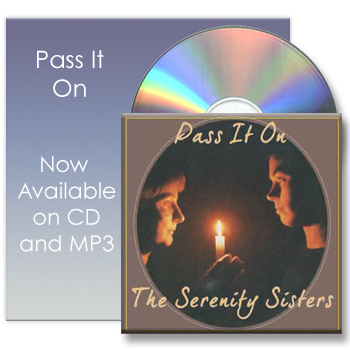 This CD features ten songs including the Serenity Sister's vibrant rendition of the Serenity Prayer and was first released in 1989. The experience of passing on what one has learned along the spiritual path forms the basis for this eleven song CD, first released in 1993. 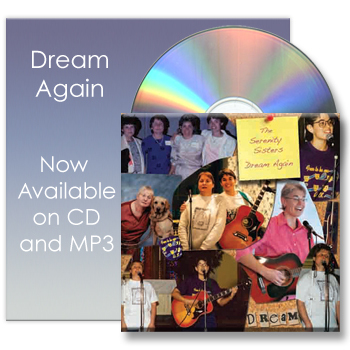 The Dream Again CD reflects the doubt one must overcome in order to realize one's dreams. It has eight songs and was first released in 1995. Buy the Digital Music Bundle - all three albums as an instant download for $20 (saves $6.97). Buy the CD Bundle - all three albums shipped to you on CDs for $20 (saves $6.97).